Working: Is Second Life as Hard to Quit as Nicotine? Quaintly has been mentioning to me about her internet connection difficulties. More specifically, her difficulties in connecting to the grid (and probably other high-bandwidth destinations). Our short discussion bursts have come to that all-too-familiar subject of "what if I leave SL, will I miss it? Go stir-crazy? Have withdrawals?" Those are my words, not hers. The dramatic divas of the grid like to be shrill about it. Whenever Linden Lab sneezes, farts, coughs policy or anything to do with how something works system-wise, they become shrill and start shouting about how they are leaving Second Life forever as though Linden Lab (or anyone else for that matter) cares a single iota. Quaintly views it the way I do: nothing Second Life or Linden Lab for that matter is important enough to really care about. Let's face it: virtual worlds are a discretionary option; not needed in the least. Thus, it's really either "entertainment" or "experimental" but nothing more. 90% of the virtual population are in it for the entertainment value, which to me the "social" aspect of it falls within that bubble. "Experimental" would include those professional organizations, commercial or educational or government who are experimenting with ways to use the virtual world to help further their overall organizational mission. All the comments on the official and other blogs, plurk, twitter and the rest with regard to anything Linden Lab does or the latest skins or fashion are not only not important, but are actually starting to sound outright stupid." To be clear, Quaintly has said she is not leaving Second Life. It's just more of a forced hiatus with extremely limited in-world time - more due to her connection problems than anything else. It's one of the reasons I have converted this blog from "Common Sensible" to "Socially Mundane" because I felt the title and description better fits the entire Second Life ecosystem on whole. It's all "stupid". Especially when dimwits like Stroker Serpentine go ballistic at Linden Lab over something impossible for them to have any control over, and in return causing them to throw-down the gauntlet on top of everyone's heads. I don't blame Linden Lab for any of it. They are a business in business to make money and be profitable. Thus their terms of service and all the rest are intentionally designed to protect them, you be damned. And I support it. Go, go Linden Lab! As for the "withdrawal" of being in-world? Well, sooner or later you learn quite rapidly just how unimportant and yes: stupid it really all is. I remember long, long ago a television commercial for Tootsie Pop. 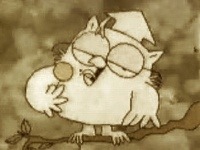 A kid wondered how many licks it took to get to the Tootsie Roll inside the hard candy on a stick1 . He was told to ask the Owl as he was wise and knew everything. The Owl licked once. Twice. A third time and gave-up. Then he bit into the hard candy to crack it open and eat the Tootsie Roll chocolate inside. His answer to the boy was "three". I've been spending a lot less time in-world. In fact, the only reason I come in-world any more is to support customers who need it and to continue what needs to be done in the management of Zodiac House - because I have promised friends I would do so. Otherwise, unlike the shrill drama-divas who really do need to get their lives into perspective with regard to what's important: I won't announce any departure in a self-loving, self-important shout-out to all those who couldn't care any less than they already do. First because I never say never. But also because that "magic" might be rekindled at some time in the future. But for now, it just isn't there. I don't know Quaintly. We are long-distance acquaintances. But I consider her a friend that I suspect will voluntarily keep in-touch, even if loosely outside the grid, albeit our one real thing in-common is the grid. So all of you who take Second Life more seriously than you should be forewarned: your attitude readjustment is down the road and it won't smack you in the face. Rather it will sneak-up on you slowly and by the time you realize your disillusionment and just how stupid all of it really is...you'll already be well down that road of "who really cares?" It will start when you realize how ridiculous the commentary at SLUniverse, Alphaville Herald and Shopping Cart Disco really are. You'll know it when you finally question yourself with "are these people actually serious?" Unlike nicotine, Second Life is a helluva lot easier to "kick the habit". There's no Great Old Owl to ask so I guess we won't really ever know exactly how many minutes, hours, days or weeks away from being in-world it takes for anyone to realize how unimportant it is, and by extension how stupid all the drama surrounding it is. That's for you to decide on your own.